It was all change at the Tour of Murcia on Friday as Luke Roberts (Milram) clinched the mountainous third stage of the race and Josep Jufré (Astana) moved into the overall lead. Sergey Lagutin (Vacansoleil) came second behind Australian Roberts, with Jufré in third. Winner of the first two stages and former race leader Robbie Hunter (Garmin-Transitions) quit the race during the stage to be with his wife, who had gone into labour with their second child. Britain’s Bradley Wiggins (Team Sky) rode well, and finished ninth on the stage at the same time as Roberts and, crucially, at the same time as all of the other main GC contenders – including Lance Armstrong (RadioShack), Andreas Kloden (RadioShack) and Denis Menchov (Rabobank). The day’s action blew apart – as expected – on the five-day race’s biggest climb, the 1,150m Alto del Collado Bermejo. Pieter Weening (Rabobank) crested the climb first and attempted to maintain his advantage with four other escapees, including Jufré. However, 20+ strong chase group containing Roberts, Wiggins and the other favourites caught and passed them before the line in Alhama de Murcia. Wiggins, currently placed 11th overall, is now set up to make his assault on Saturday’s decisive 22km individual time trial. Whoever wins the time trial is likely to take the overall lead and keep it until the race’s final stage on Sunday. 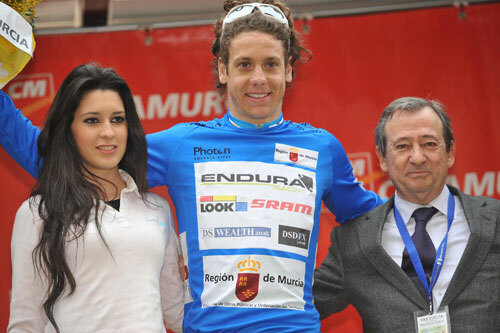 British-based Endura Racing Team continue to punch above their weight in the Tour of Murcia, with Frenchman Alexandre Blain working hard to retain the blue intermediate sprint jersey during stage three. Along with Blain’s success, Endura’s Ian Wilkinson was in sixth spot overall before the start of stage three after two top ten places. Endura have taken on a punishing European racing schedule, but have quickly found their feet amongst the vastly-better resourced ProTour and Pro Continental squads. Even on stage three’s big climb, the Alto del Collado Bermejo, the squad’s riders kept on fighting. “The climb was about 20km long and one car wide. It was brutal. Jack [Bauer] got dropped on the way up but managed to get back on,” Beckett said. 10. Jose Herrada (Spa) Caja Rural all same time. 9. Pieter Weening (Ned) Rabobank all same time.